Fall is finally upon us and that means beautiful weather, a plethora of outdoor activities, and pumpkin-spiced everything. According to our Baltimore research survey conducted by Observation Baltimore, Maryland offers a surplus of festivals, places to pick seasonal fruits and vegetables, as well as other activities to do during fall. According to our Baltimore research survey conducted by Observation Baltimore, Maryland offers a surplus of festivals, places to pick seasonal fruits and vegetables, as well as other activities to do during fall. According to the 540 Baltimore residents surveyed, the most anticipated fall activities are festivals (22%), pumpkin picking (14%), football (12%), Halloween (11%), and Thanksgiving (8%), respectively. The most popular festivals are the Maryland Renaissance Festival (26%), Beer and Wine Festivals (16%), Apple Festivals (11%), Fells Point Fun Fest (11%), and the Baltimore Running Festival (4%). Popular beer and wine festivals include Oktoberfest which is this Saturday, October 10th, and the Belair Edison Beer and Wine Festival. Other festivals that will be attended by Baltimore residents include the Farmers Market Festival, Fairfax Fall Festival, Fright Fest, Greek Food and Cultural Festival, Halloween Festival, Hampden Fest, Irish Festival, Summers Farm Fall Festival, Takoma Park Fall Festival, Taste of DC, Westiminster Fall fest, Truckaroo, and the Thomas Johnson Elementary Middle School Fall Fest. For picking apples or pumpkins, our polled Baltimore residents reported the places to go are Webers Farm (15%), Baughers Farm (10%), Larriland Farm (6%), Orchards (4%), and Valley View Farms (3%). Webers Farm (12%), Baughers Farm (6%), and Larriland Farm (5%) emerge as the top three places to go for a hay ride. Popular orchards mentioned include Milburn Orchards, Brown’s Orchard, Bulter’s Orchard, and Lohr’s Orchard. When Baltimore residents are not attending festivals, picking apples or pumpkins, and going on hay rides, other favorite fall activities include tailgates/football games (12%), preparing costumes/decorating for Halloween (9%), watching the leaves turn (8%), participating in sponsored walks (5%), and hiking (4) the beautiful woodlands and trails in Maryland. This Halloween, a small majority of polled Baltimore residents will be spending about the same compared to last year, whereas 26% will be spending less and 18% will spend more than last year. Age of children dictate anticipated many households’ Halloween spending, but costume purchases among adults have experienced recent growth. According to an NBC Today poll, 13-14 years old (28%) emerges as the top response to how old is too old to trick-or-treat. 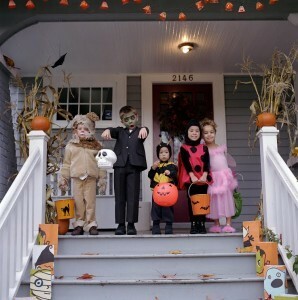 You are never too old (25%), 15-16 years old (22%), followed by 17+ (12%) and 11-12 years old (12%) emerge as the top five responses to how old is too old to trick-or-treat. This entry was posted on Wednesday, October 7th, 2015 at 4:29 pm. Both comments and pings are currently closed.